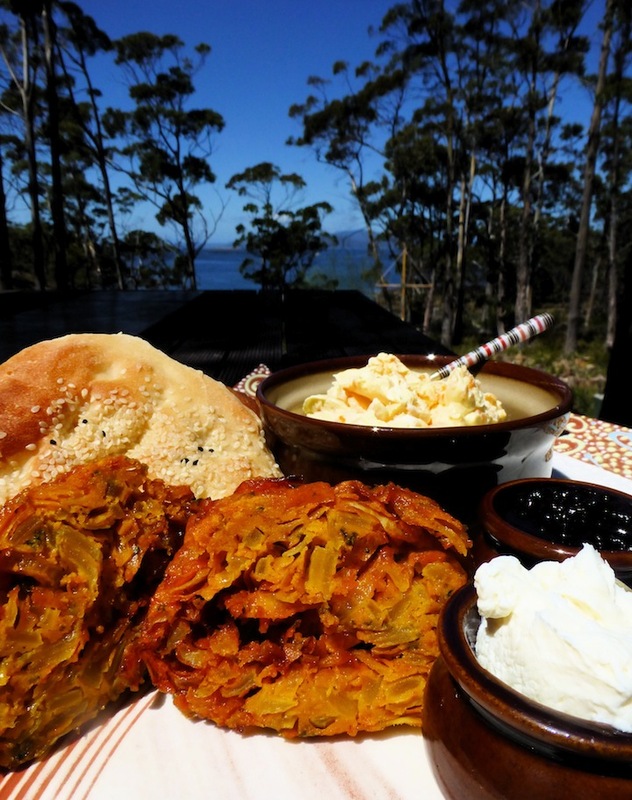 A Taste of Turkey: Or a Bit of Bruny Bling. Brunyfire’s collection of clay cooking pots from around the world and their use on Bruny Island using the local produce has always been driven by first hand experience, but she is not adverse to help from friends and family in helping to add to the collection! Being able to travel to foreign shores to taste the local cuisine and to obtain the clay pots that are used traditionally in those countries that use them, has been an ongoing obsession. Sometimes it’s not always convenient or possible to travel everywhere, so it was pretty exciting to have the taste of somewhere unknown (to Brunyfire that is) come close to Bruny. 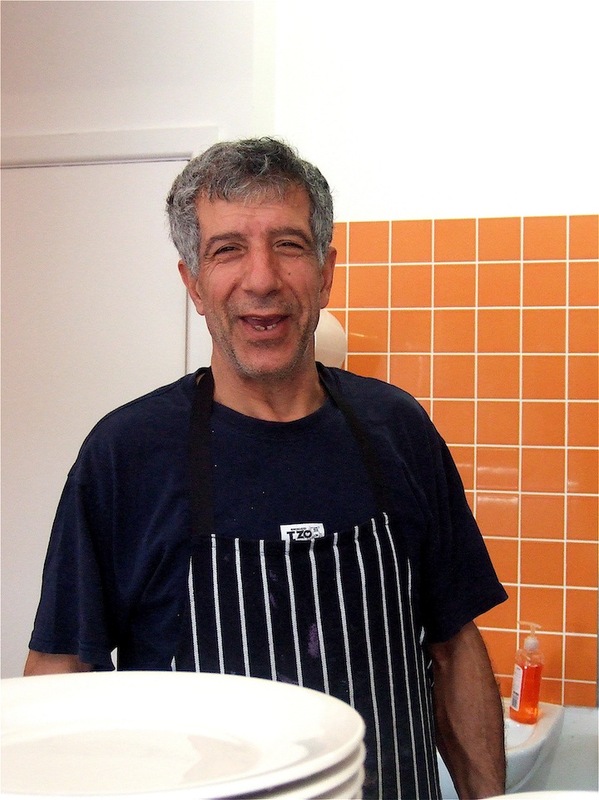 Pasha Ozkilinc is Turkish and migrated to Tasmania in the 1990s after a chance meeting with his future Tasmanian wife whilst they were both working in Istanbul – he as a chef in his own restaurant and she as an English teacher. Fortunately for Hobartians, the taste of Turkey has been brought here with Pashas (in Murray Street) and better still, Pashas in Kettering – an ideal reason to get up even earlier for the opportunity to breakfast at Pasha’s before boarding the Bruny ferry. 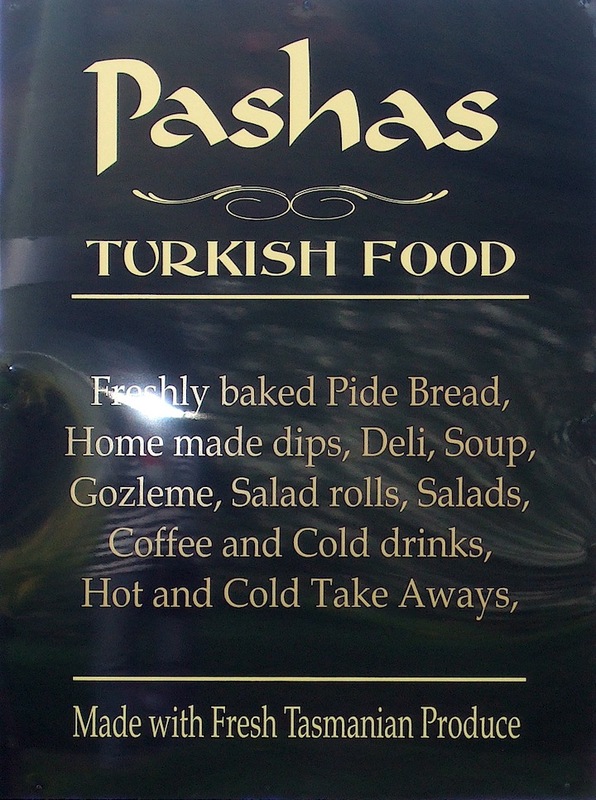 Open every Sunday and Monday, Pasha gets up early in the morning to prepare his dips and pide breads. These range from the delicious beetroot (kız güzeli), at its sweet, earthy, deep-red best which is roasted then mixed with creamy yoghurt and garlic, to the carrot/yogurt dip (yoğurtlu havuç) – again creamy and sweet – to dolmas and to the delectable onion bhajis just to name a few menu items. 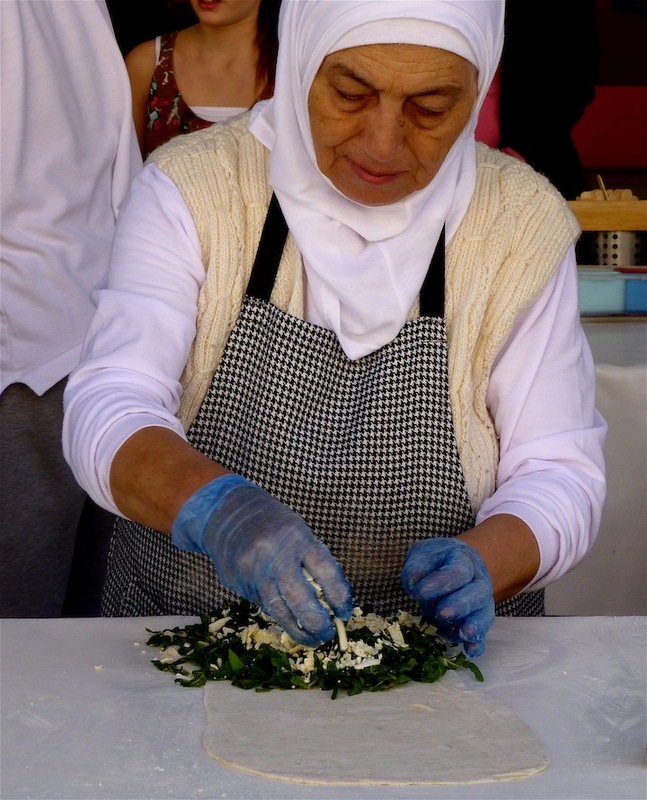 Istanbul, on the coast of the Sea of Marmara, close to where it cosies up to its Bulgarian and Greek neighbours, takes its cooking traditions from many elements of Ottoman court cuisine, with its lighter use of spices compared to elsewhere in Turkey, and it is this lightness of touch that makes Pasha’s cooking stand out. In particular, his gözleme’s. 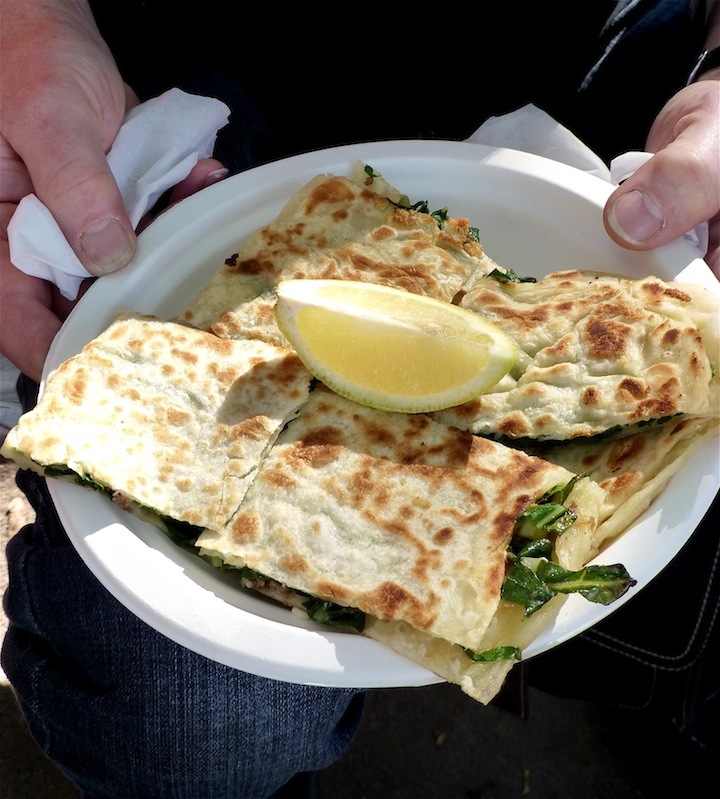 Now most Aussies know about gözleme’s. If you don’t, your gastronomic education is sadly lacking. 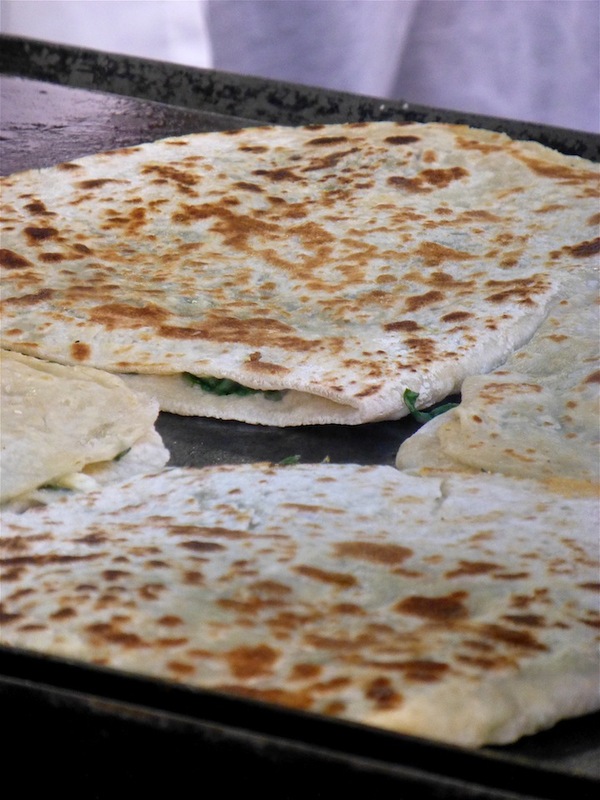 Gözleme’s are traditional Turkish savoury pastries made from hand-rolled dough, lightly brushed with butter and eggs, folded and sealed with a range of delicious fillings – from lamb, mushroom, fetta and spinach to a variety of sweet options. These are cooked on a griddle, traditionally by the village women using a concave metal dome over an open fire, called a sac. 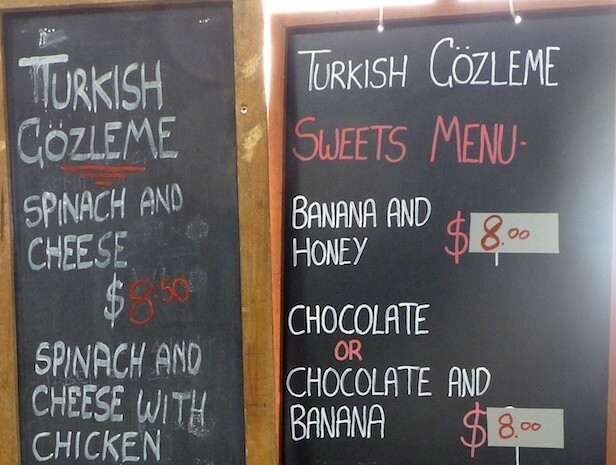 Just about every market in the major cities in Oz has a gözleme stand……. 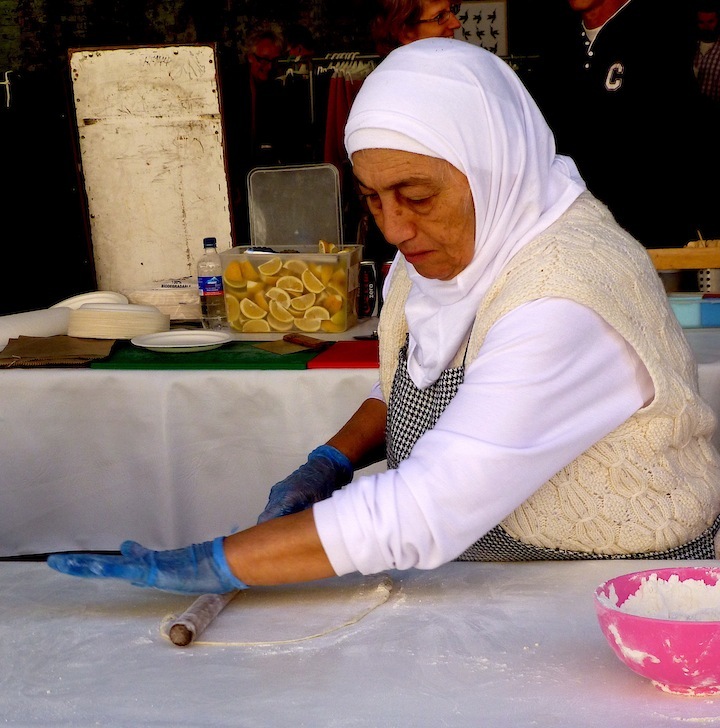 ……….where a group of Turkish women take turns in rolling the dough……… ……..filling and folding the dough into a sealed pocket containing, in this instance, a filling of fetta and spinach. These are then fried on a griddle on one side…………. …………then flipped over and done on the other. Finally to be served up piping hot with a couple of slices of lemon. 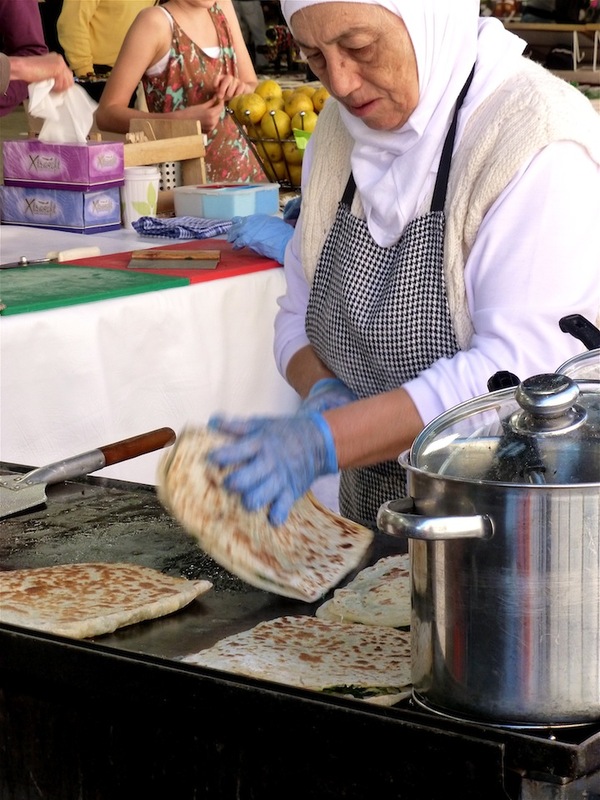 But to Brunyfire, a gözleme from Pasha’s place at Kettering beats these hands down. 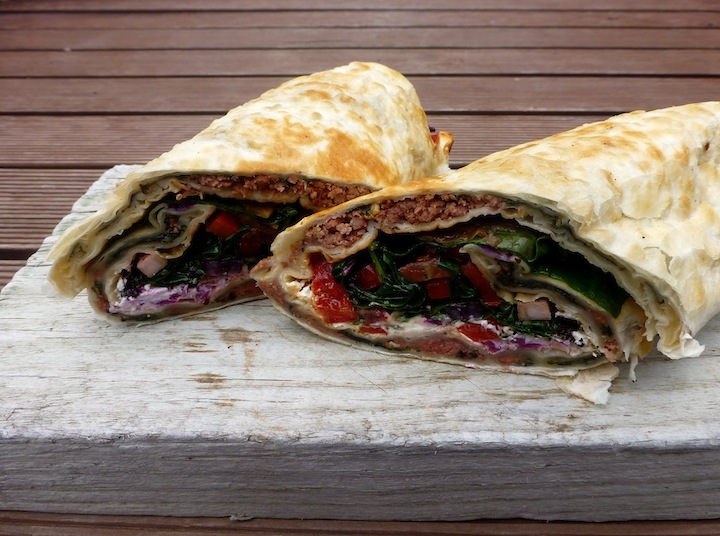 He not only creates a good traditional lamb and spinach version, but he then rolls this around a fresh salad of sliced tomato, lettuce and a yoghurt and garlic dressing. 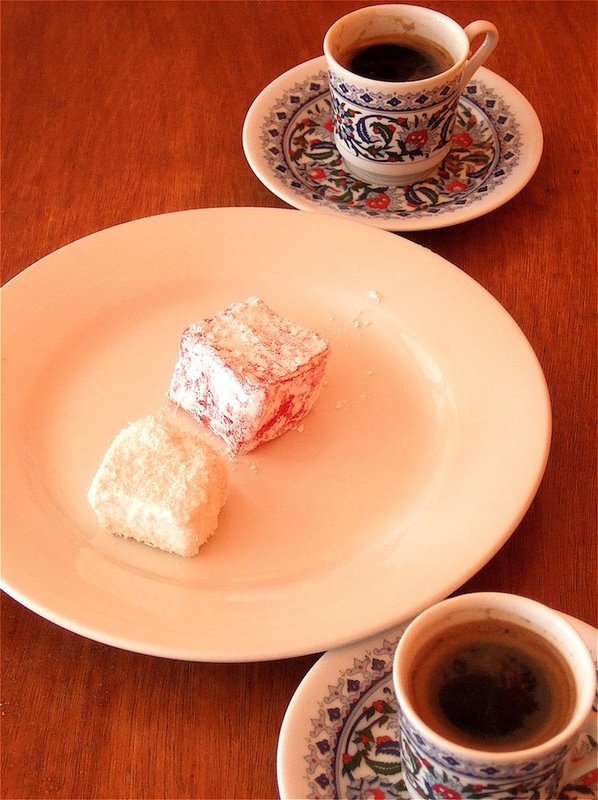 When we do have time to stop, we usually finish off with a freshly made cup of coffee and Pasha’s own Turkish delight – a rose and pistachio version. 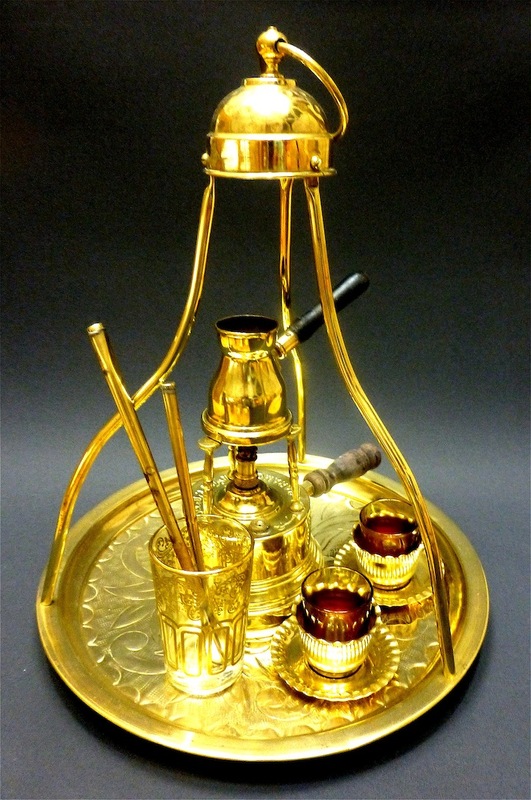 When a visit to the local Hobart auction rooms several months ago netted a real bonanza in this great Turkish coffee set…………. 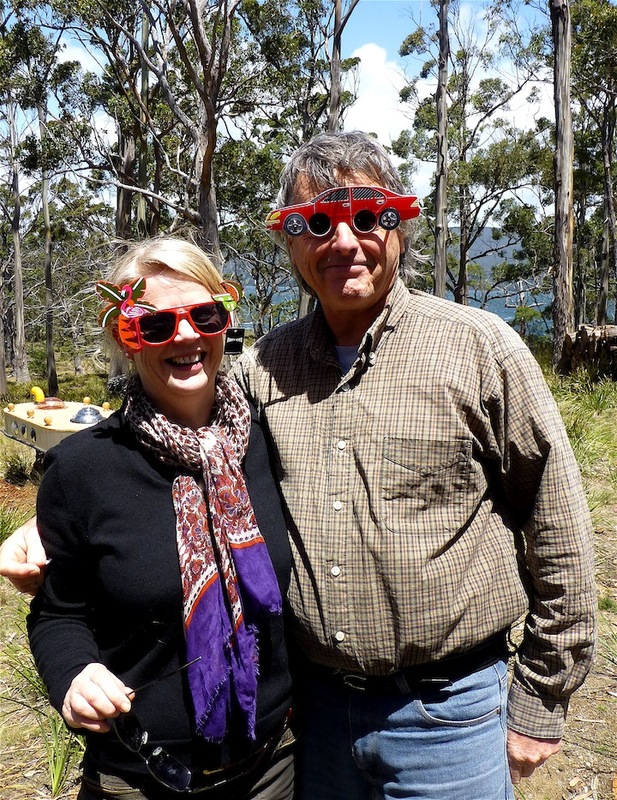 ……..Brunyfire snapped it up to add to the cooking with fire collection – and hence this story! The set was complete with all the accoutrements, and because of its sorry state Brunyfire’s successful bid netted the set for about $17 – a bargain! With a little elbow grease, Brasso and a soft cloth it polished up a treat. Then an additional Vinnies gold lustred glass (to store the whizzer and spoon in), a couple of gold tinted glasses to replace the crappy cracked china cups and another couple of (slightly larger) Vinnies gold tinted glasses for the obligatory drink of water, were added – good as new! 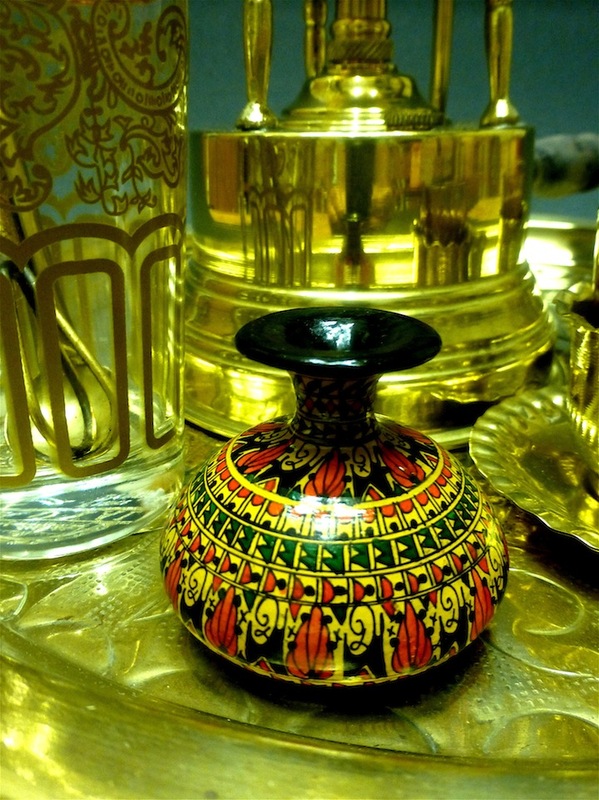 The little Turkish ceramic pot, thrown and hand decorated……….. …………was a present from a couple of fellow travel buddies after their trip to Turkey some time ago………… ………Wendy and Roscoe – she loves to travel and he loves cars!! 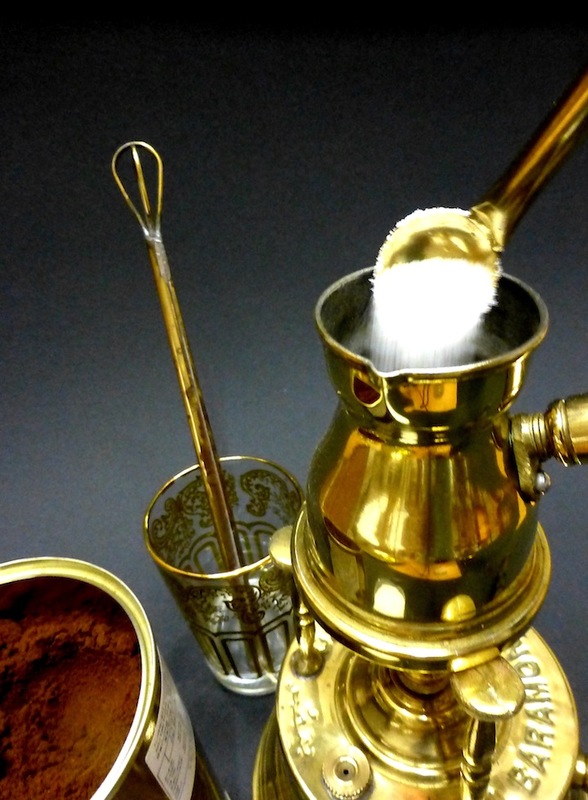 Basically, Turkish coffee beans (from Brazil or Central America) are roasted and then finely ground – traditionally, they would have been ground in a mehbaj but nowadays, they are purchased in the ground state – the coffee is boiled in a pot called a cezve, usually with sugar, and served in a cup where the grounds are allowed to settle. 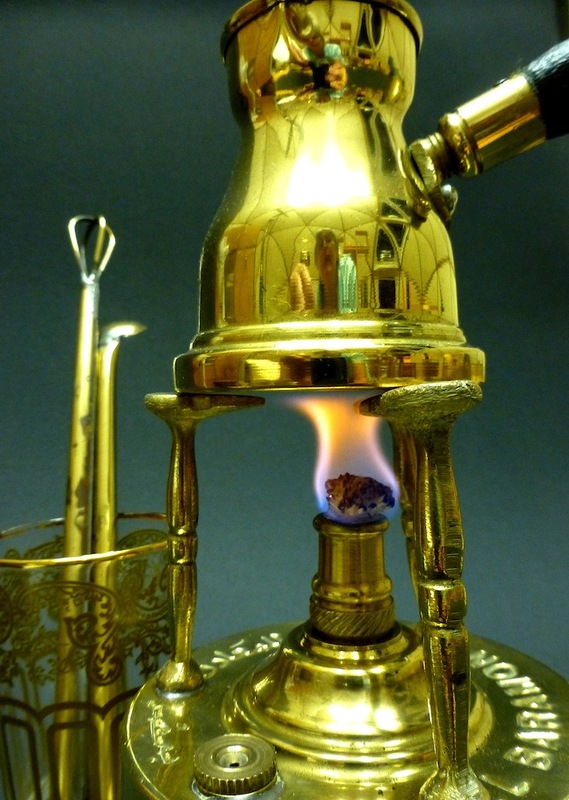 The cezve is filled with a little more than two cups of water, and placed onto the burner which is fueled with methylated spirits – this provides the gentle flame needed to bring the coffee to its correct heat. 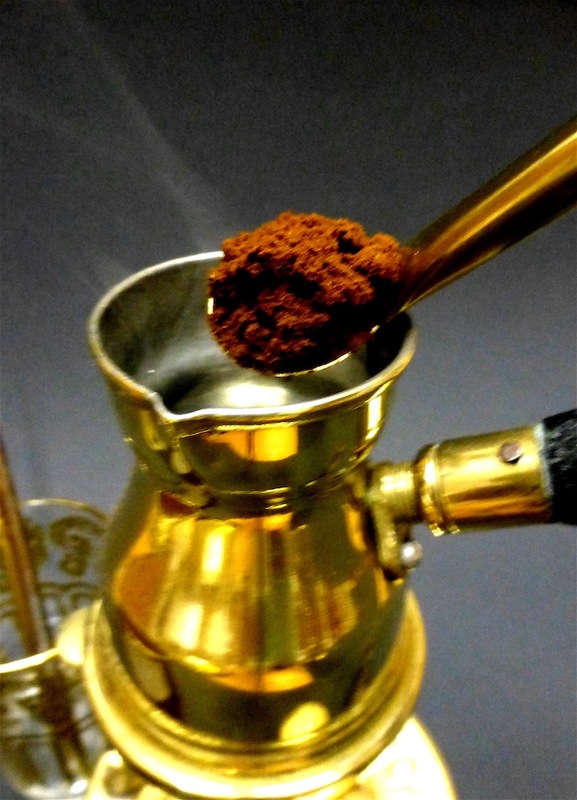 Heat the water a little and then add a spoonful of coffee for each cup………… Brunyfire used coffee from Kurukahveci Mehmet Efendi who have been a coffee roasting company since 1871 and is currently the biggest and the oldest coffee company in Turkey. Add a spoonful of sugar for each cup……… ………..and when the coffee starts to sink into the water, and the sugar has dissolved, stir it several times and turn down the heat. Keep up the gentle stirring until the brew starts to foam, then encourage the foaming by using the whisk. 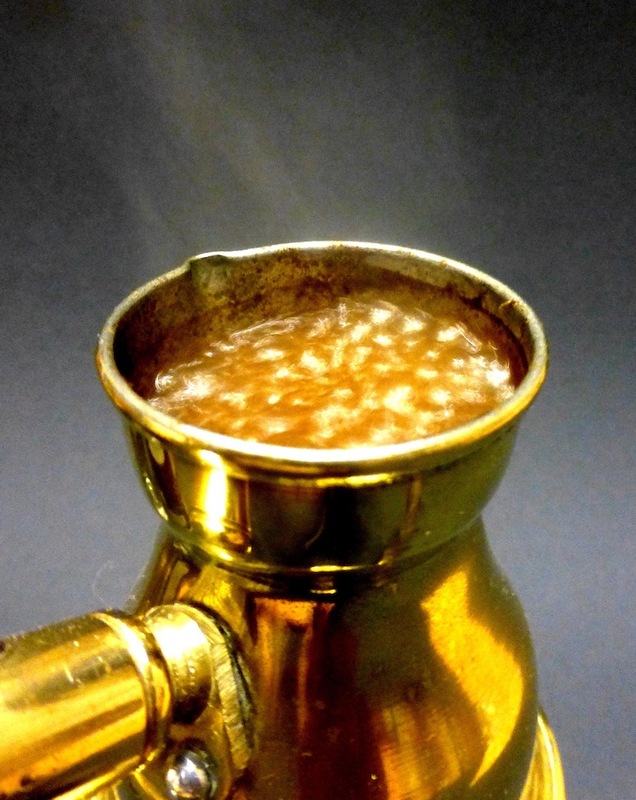 Turkish coffee should not be allowed to boil – the key is to create a thick froth which usually occurs around 70 degrees c (note: much cooler than boiling point at 100 degrees c) – if the coffee does boil, the foam will evaporate. Encourage the coffee to foam as long as possible without boiling – if the coffee starts to rise in the cerzve, then remove it from the heat. Repeat this process of rising cooling 3 or 4 time, then pour the coffee the cups ensuring that each has an equal amount of foam.